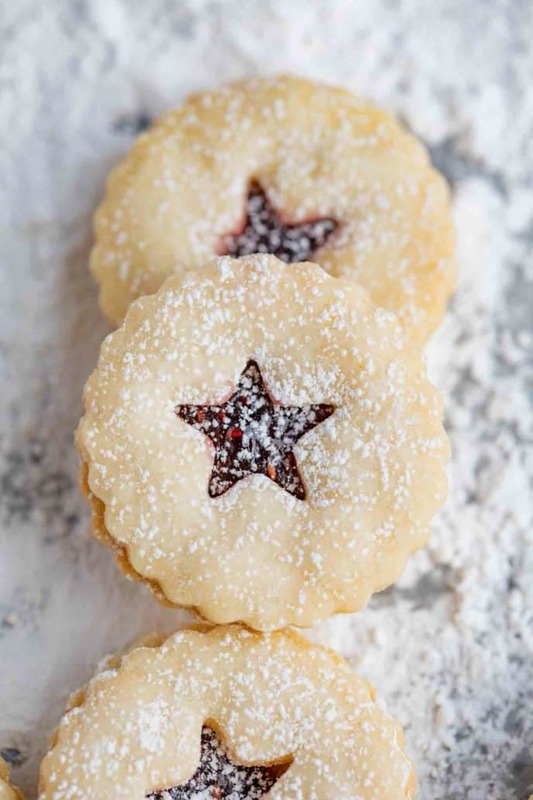 Linzer Cookies are almond flavored shortbread cookies with a raspberry jam filling and dusted with powdered sugar for a festive jam filled sandwich cookie. Spring is in the air and fun fruit desserts are popular on the site including Lemon Cookies, Berry Pie and Strawberry Shortcake. Sandwich cookies don’t have to be so intimidating you don’t want to tackle them at home (like these Peanut Butter Do-si-dos Cookie Sandwiches)! They’re just as simple as making a frosting or filling between two cookies. In fact sandwich cookies benefit from this filling because it allows the cookies to stay extra moist and chewy longer than single cookies can. Larger Linzer Tortes come from Austria and the smaller version, Linzer Cookies were made popular in Hungary from a classic shortbread recipe. 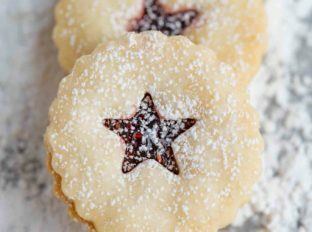 These Linzer Cookies are made from a modified shortbread recipe with almond flour added to the recipe. You can of course make your own ground nuts for this recipe, but the use of almond flour makes this recipe as easy as your favorite Chocolate Chip Cookies recipe. If you’d prefer not to have the effort of making sandwich cookies with cut out cookies you can actually just scoop these cookies with a one tablespoon ice cream scoop and press in with your thumb to make thumbprint cookies you fill with the reduced jam. If you brush with the egg whites you don’t use (since you’re only using egg yolks) and garnish with chopped nuts you like in these Turtle Cookies you’ll have a delicious easy alternative to the classic Linzer Cookie. Pssst… don’t make my mistake, I sifted powdered sugar on them again after sandwiching them together to make them extra pretty and it got onto the centers. 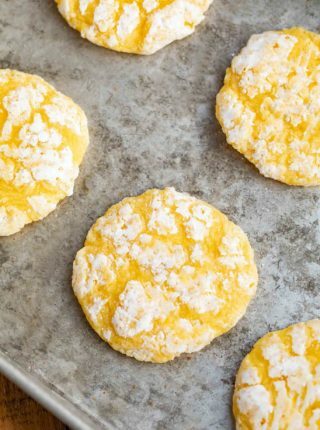 Only sift on the powdered sugar onto the cut out cookie before sandwiching to avoid the center jam from being covered in sugar too. Almonds are most commonly used in Linzer Cookies, but you can also use your food processor to make ground almonds, walnuts or pecans in Linzer cookies if you’d like to grind your own nuts for the mixture. We use almond flour for ease and for the fine texture in the cookies. To add more almond flavor you can also swap out the vanilla extract for almond extract too. Be careful to not overmix your flour mixture in your electric mixer, the tenderness of the cookies is important. Make sure you rest your cookie dough, you can stamp out the cookies first and cool on a cookie sheet or you can wrap the dough in plastic wrap and chill it first before rolling. Make sure you bake the dough on parchment paper or a silicone mat on a baking sheet. Do not assemble until the cookies are at room temperature and make sure you reduce your raspberry preserves. Reducing the jam allows it to act as a glue to combine the cookies and prevent sliding. For a spicier, less fruity flavor you can swap out the lemon juice and zest and add in 1/2 teaspoon nutmeg and 1 teaspoon ground cinnamon. Store Linzer Cookies in an airtight container with parchment paper between layers of cookies to prevent the powdered sugar from sticking together. You can keep Linzer Cookies for up to one week at room temperature and up to 3 months if frozen. Classic Linzer Cookie shapes include hearts (perfect for Valentine’s Day), circles, stars, diamonds and flours with either scalloped or classic round cookie shapes. 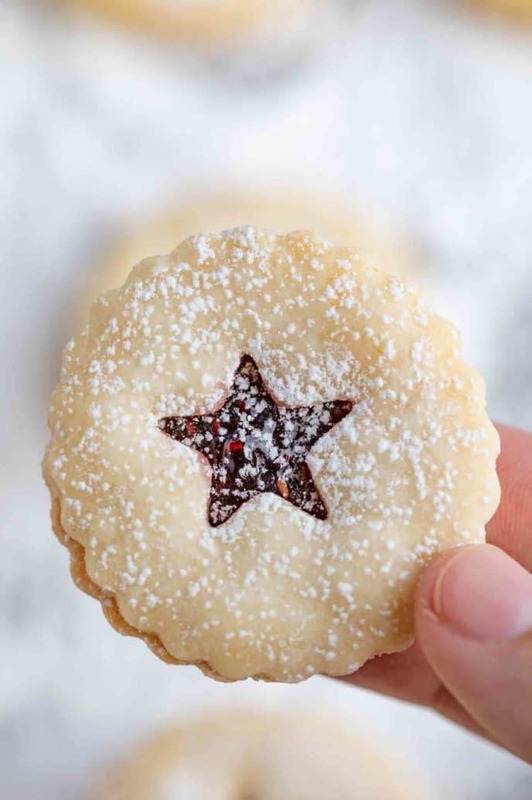 Linzer Cookies are almond flavored shortbread cookies made with a raspberry jam filling and dusted with powdered sugar for a festive jam filled sandwich cookie. To a stand mixer add the butter and sugar and beat until light and fluffy before adding in the eggs, vanilla, lemon and lemon zest. Add in the flour, almond flour and salt on low speed until just combined. 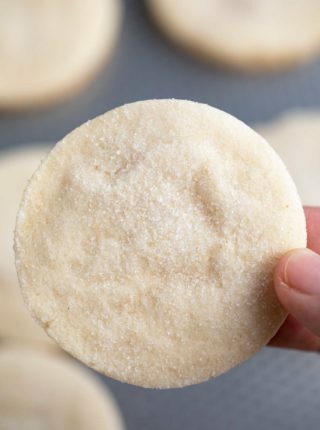 Gather the dough into a ball then roll to 1/4" thick, using a scalloped 3" cookie cutter to cut out 12 cookies then stamp out 12 stars and gather all the scraps and re-roll using a bit of extra flour if the dough gets a bit sticky. Stamp out 12 more cookies then chill all the cutouts for at least an hour before baking in a 350 degree oven for 8-10 minutes. Before assembling let your cookies cool completely, simmer your raspberry jam on low heat for 5-7 minutes until reduced by one-third then spread a spoonful onto the cookies without the cutout. 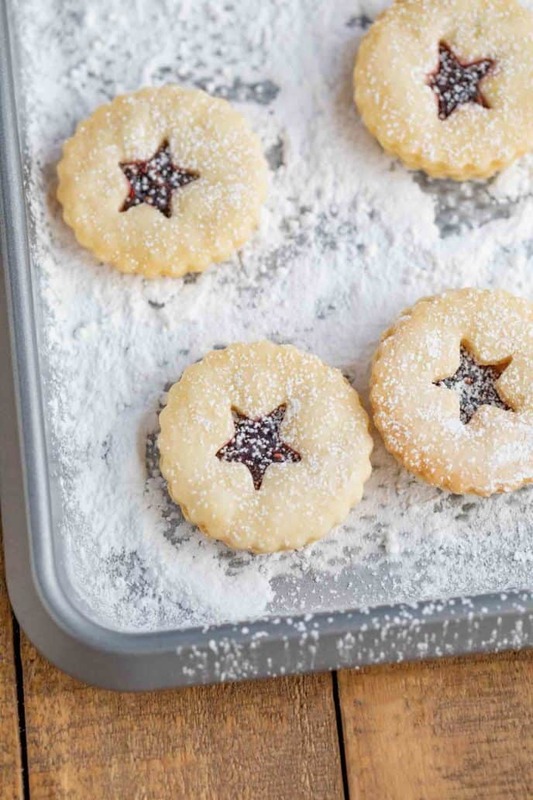 Sift powdered sugar onto the cookies with the star cutouts then carefully place them onto the cookies with the raspberry jam and press down carefully to spread the jam fully carefully. These look so good! I want to bake some up today with the kiddos! 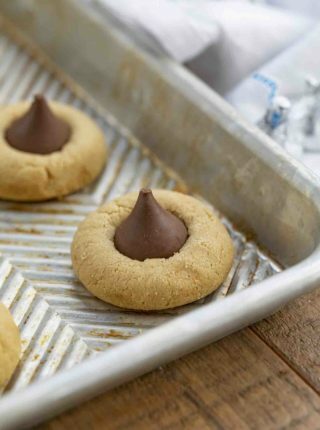 These cookies sound delicious right about now! These are on my must-make list! I am baking cookies every week. 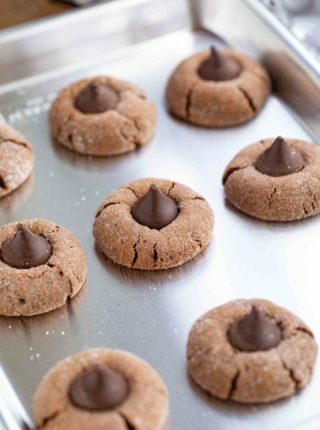 These are on my next-to-do baking list! They look divine! These looks so delicious Sabrina! I think my little girl would go crazy for these – I will be trying them! What a perfectly cut cookie! Love this traditional recipe, I’ll have to make these this weekend!